When one of Liane Moriarty’s funny, quirky books appears on my library list, I know it will be a mood lifter, and The Hypnotist’s Love Story was no exception. With the style I came to appreciate in What Alice Forgot and The Husband’s Secret, Moriarty connects unlikely possibilities with ordinary circumstances and likable characters. The story revolves around Ellen O’Farrell and the clients she tries to help with hypnotherapy. From the bride to be who is trying to give up smoking to the overweight lawyer, Moriarty mixes serious issues with gentle caring – and a few laughs. When Ellen meets Patrick, a widower, who has a former lover who is stalking him, the scary incidents dovetail with her new romance. Saskia, the stalker, is one of Ellen’s clients. All ends well but not before the plot takes some strange turns. 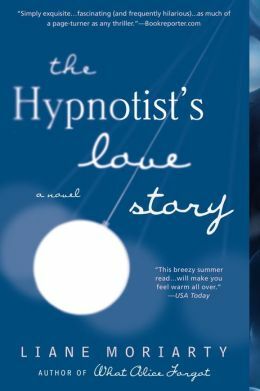 With not as many surprises as her later work, The Hypnotist’s Love Story is still a page-turning fast read and a welcome change of pace. This entry was posted in book review, books, reading, romance and tagged Alice, Husband's Secret, hypnotherapy, hypnotism, Liane Moriarty, Moriarty, romance, stalkers, The Hypnotist's Love Story. Bookmark the permalink.